You must be a member of the Cologne Professional Networking Group to attend this activity. Would you like to join this group? The Rhineland Pitch (est. 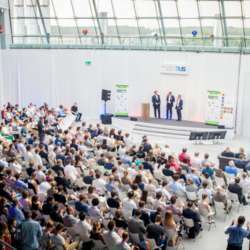 Protected content a regular event format and now the largest startup pitch competition in Germany. Here life is simplified, thought outside the box and industries turned upside down! At the Rhineland Pitch, you can witness live the forefront of the Industrial Revolution and see the big stars in the startup sky of tomorrow! Up to four startups have the chance to present themselves with a seven-minute pitch in front of a high-caliber audience of investors, corporates and like-minded people. Then there is a seven-minute Q & A session with the audience. The winner will be determined by the audience via online voting. In addition to the pitch competition, the Rhineland Pitch offers the best opportunity to expand your own network with drinks and snacks. The Rhineland Pitch is open to investors, entrepreneurs, business leaders, representatives of private banks and professional consultants. All those who would like to watch, are invited to secure their participation on the booking.